If you have a bank account, it’s likely that you carry your debit/credit card with you wherever you go. And if you have multiple bank accounts, your wallet might be cursing you for it. Not to mention using your card online also carries a risk of your info getting stolen. UBL might have a solution to make your online shopping easier, enter the Wiz Virtual Prepaid Card. This is similar to Easypaisa virtual debit card which did pretty much the same thing. A virtual prepaid card is designed with safe and secure online payments in mind. The Wiz Virtual Prepaid Card is powered by MasterCard and works at any online store or payment portal which accepts it. Using the Virtual Prepaid Card, you won’t need to share your debit or credit card information online every time you have to make a payment. You can get up to 5 virtual prepaid cards at a time. After your card is created, you will receive an SMS or an e-mail with the card number, CVV and it’s expiry date. You will be charged Rs. 300+FED for creating a virtual prepaid card. If you make an international transaction, you will be charged 4% of your transaction in USD or PKR. If you use any other currency, you will not be charged the fee. Reloading the virtual card is free. Rs. 5 on a local transaction. Rs. 35 on an international transaction. If you have been biometrically verified at UBL you will have a limit of Rs. 500,000 per year. Otherwise you’ll have to make do with Rs. 100,000 per year. I would rather wait for EasyPaisa card. UBL isn’t known good for quality of service. Card charges are high too. I am thinking to sell prepaid card (reloadable) in Pakistan through an agent. I am still seeing possibilities of reload via legal channels. Certainly UBL rates can’t be justified and are quite high. How JazzCash is providing Visa card then? Easypaisa already providing ATM cards, as JazzCash providing ATM cards. We are actually talking about UBL Virtual Card. Easypaisa, JazzCash, Omini etc are mini banks they can’t provide virtual cards. Minimum amount you need to create UBL VC card is Rs.500. It can be use for online shopping. Come Bank EasyPaisa Virtual Card. had you try on facebook ads or Google adwords ? Hey!! If facebook and google accepts Prepaid cards, then you will be able to use them. If they dont accept prepaid cards, then both UBL Wiz and MCB lite wont work. Hi, Can we use Wiz card in games .I am student, Is it possible to get a wiz card without involving my parents. Hello, I have used my MCB Lite card on Steam, GOG, Play Store and Origin. Since Wiz and Lite both are prepaid cards, Same will be for Wiz. You can buy games with that. But I don’t think you’ll be able to get one without a valid CNIC. You sure it works on Google play? How much is the transaction fee? Recently my friend told me his card stopped working since a few days on aliexpress and when he called the csc they said it wont work online. bhai aapka koi naam hai k nahi? G nam b likha but fail ho rha ha. i inter in cardholder name my name but failed then wrote mcb lite failed again. salam yar i activated internet session permanently but when i order on alixpress payment cannot approved what should i wrote in order cardholder first name last name? Your full name and the exact spellings that were registered by ubl. Call them and confirm your exact name spellings registered by them. ok but I’m talking about mcb lite card. There inst any transaction fee, but you have to pay Taxes on Currencies other then pakistan rupees. If your play store displays price in PKR (pakistani Rupees), you will be charged exact amount without any taxes. You don’t need to have bank account to get MCB lite card? Does it work on Netflix? Thanks and I checked mcb lite card is not available in my village branch that’s frustrating, after easypaisa suspended virtual debit card, have no choice to watch netflix. And what is this mobile wallet, and what it has got to do with mcb lite card, what should I require to get mcb lite card, problem with me is my signatures are always different hence I can’t open bank account. its app is called MCB Lite Mobile Wallet, used for balance inquiry and bill payments. Yeh bhi theek hai, account se withdraw to waise bhi debit card se karna hai. Because mcb lite is not available here so I m thinking about ubl wiz virtual card until easypaisa virtual debit card functions again, I m addicted to netflix, otherwise I have no interest in online shopping because these Pakistani online sites are scams and looting us. whatever floats your boat ?? I filled and submitted my form for mcb lite card online from mcb website, when should I expect to get card, will they call me to bank for procedure, how many days it would take. Salam kamil bhai mera mcb card received ho gya ha mera mcb me koi account nhi ha kya mujhe cnic ki copy aur koi form bhi fill kar ke mcb branch me jana pare ga card ke sath to koi form nhi ha form kaha se mile ga guide me thanks. mera to tcs ke through aya magr mcb wale zayade nhi jante ap bank se card wasool kar k us me 300 rup branch se deposite karo phir helpline se card active karo wahin bank se helpline se cal karna k card active karo ager wo kahen k pehle account active karo to phir helpline walo ki baat bank walo se kara dna bohot muskil se mera card active kya kabhi kehte k account active karo kabhi bank wale kehte k helpline se active karo karte helpline wale hi hain magr zyada jante nhi. Wao worst day of my life, jab 20 kilometer travel kar k main apni tehsil ki branch par gya to mcb lite card Liya to unhon ne kaha helpline se activate karao, maine call ki to unhon ne kaha card mein deposit karao pehle jab phir branch gya to unhon ne kaha hamare pas ID nahi hai dosri branch jao 25 kilometres door aik aur branch gya to unhon ne kaha hamare pas password nahi hai, password reset honge bad mein, maine kaha kab honge to bolte hen pta nahi koi cooperation nahi ki BC. Yar in ko kuch maloom nhi helpline se hi active ho ga bus sirf kisi tarah 300 rup add kar do card me acount no mobile no hi hoga phir helpline se card active karo branch wale nhi karte helpline wale hi krte hain.mera bhi 3 4 din bad active hova 400 500 ka balance b laga helpline call kar kar k.
Nahi wahan si hi deposit hon ge ager branch walo me kisi ka mcb account ha to un ko request karo k apne account se hi tmhare card par 300 deposit kar dain account se ho gye ga mcb ke mujhe b mcb walo ne account se add kar dye the aur jb deposit ho jain to helpline se hi card activate karwana wo na karan to un ko kaho ke call kisi experience officer ko forward kar dain ager phir b na karain to mcb branch manager ko request karo k apne ptcl no se helpline call karain phir helpline wale card activate kar dain ge bohot tang krte hain. yar me asan tariqa bata hon jb me bank gya to card issue jo krta ha us ne mojhe kaha k pehle 300 rup deposit kro me ne kaha kr do us ne kaha k link down ha phir us ne kaha k me apne account se dal deta hon phir us ne apne account se 300 deposit kye wo mujhe foran received ho gae msg aya phir me ne helpline walo se bat ki unho ne bohot tang kya kabhi kuch kehte kabhi kuch phir me ne us bande bank wale se contact kya to us ne kaha k wo card activate nhi kr rhe phimr bank wale bande ne bank se hi helpline walo ko call ki to 1 lady ne sari story sunne k bad mujhe kaha k ap ab helpline call kro me ne kaha k me nhi krta us ne kaha k me ap ko call krte hon phir us ne mere no pr call kr ke foran card activate kr dya ap b aisa hi kro branch manager se bat kro k kisi b mcb accout ya lite card se ap ko 300 deposit kr de warna me helpline se ap ki complaint kro ga k ap co- operate nhi kr rhe. Yar in ko chorna mat ab itna wait kya ic lye bar bar keh rha hon k branch manager ko sari story batao aur us ko request karo k me 20/25 kilometers dor se ata hon kindly apne account ya lite card account kisi ka to ho ga us se deposit kr k branch se hi call kr den to fran active ho jae ga shayd manger coprate kr de aur ubl account open krne ki koi zarrorat nhi bs cnic ki copy ho aur apne friend ko kehna k wiz internet card bna de us k lye account ki zarrorat nhi wo kuch form fill ke bad 10 minutes me card bna de ga aur jitne chaho pasie b deposit kr de ga baqi us ko pta ho ga account open mat krna wiz inertnet card without account banta ha. Kia ubl internet card worldwide accepted hai? Suna ha accepted ha mere pas nhi net pr comments me dekha aur ubl wiz internet card k lye koi account ki zarorat nhi. me ne kab kaha fazool ha me ne ye kaha k account ki koi zarorat nhi aise ban jata ha waqi lite card se acha ha 20 minutes me mil jata ha acceptance ka pta nhi but log khte hain chalta ha dono banwa lyna wiz internet aur lite card ko b activate kra lna wo thora mushkil ha but ho jae ga.
mere branch b bohot dor ha me ne abhi aur deposite nhi kye aur na hi internet session activate kya ha aur kabhi Netflix b use nhi kya itna problem nhi ha ap kisi b mcb branch employ ko kahin k wo apne account ya lite card se deposit kre foran ho jain ge us ko apna mobile no b bta do wo us pe deposit kr de ga aur specially branch manager ko kaho k wo 300 deposit k bad apne branch no se hi helpline call kre to wo foran card b activate kr den ge bus thora angry guse se bolo ya kaho k account activate nhi krte to close hi kr do. mera internet session ka masla ha activation ka aur deposits k lye b dor jna prta ha tm branch manager se bat kr k paise deposit kro aur wo hi tmhain branch se call kr ke card activate kra dain ge khod helpline par bohot tang krte hain bs ic ke aliwa koi tariqa nhi ha. Yar hbl b acha ha me ne suna ha magr tm lite card me paise dalo activate ho jae ga don’t worry thori mushkil ha aur ubl me agr dost ha to us ko kahrao k wo ubl wiz internet card bna de wiz 4 tarha k hain tm us ko Internet card ka kehna wo kuch procedure k bad foran bna de ga cnic ki copy le jna baqi wo tmhain bta de ga me zyada nhi jnta but net pr comments dekha hain k ubl wiz internet card acha chalta ha but lite card me b zaror deposit krna wo b activate ho gye ga.
No ubl wiz k lye account ki koi zarrorst nhi ubl wiz ki 4 qisam k card hain ubl wiz internet net card banwana baqi fazool hain tmhain dost bta de ga aur 10 15 minute me bna b de ga aur lite card ka jo officer coprate kr rha ha us ko kaho paise deposit krwa de ya manager ko kaho aur request krna k deposit k bad helpline pr call b bank no se krna wo card b foran activate kr de ge dobara tmhare no pr call kr ke. Mere bhi 250 lag chuke hen helpline call kar kar k, Har bar bolte hen system kam nahi kar raha bad mein call kijiye GA, mujhe netflix pasand hai esliye etna inko bhugat raha hon werna inse to bat bhi na Karon BC useless service. salam kamil bhai jb card received ho jay to internet session maximum kitna on rah sakta ha kya permanent b on ho sakta ha? Aur easy deposits b kar sakte han means k branch k aliwa jazz cash ya easypaisa se? Thanks 4 rply i asked 4 top up the card not for withdraw from it? Aur 1 week hone wala ha helpline se call b ai helpline walo ne within 7 days ka kaha ha kab tak mill jae ga? thnks me ne suna ha k jazz cash se be ho jata aur telenor microfinance bank aik ho gya hain shayed ab easypaisa se b ho jata ha infact youtube pe aik video b ha jazz cash ki aur minimum kitna load kar sakte hain. app ne kabhi minimum add kya ho account me? Salam kamil bhai mera mcb lite card mil gya ha kya mujhe branch me cnic ki copy ke sath koi form b fill kar ke jana ho ga jab k card ke sath 1 2 books ke aliva koi form nhi ha form kaha se lon mera pehle koi mcb account nhi ha kindly guide me. how did you applied for this card? I applied through online website card received within 10 days application form nahi tha sath me ne suna ha ka online wo application form dete hain. Aur card par koi nam b nhi aur sirf visa likha ha. ok i will visit the branch.Is their any difference between simple lite visa card and visa gold card? my card has logo visa is your card also visa logo or visa gold logo? I just want to confirm that will it work online globally international? order from card what should i write in cardholder name like first name last name because no name available on card. Salam kamil bhai mera mcb card recvied ho gya ha kya mujhe activation k lye mcb branch me cnic ki copy k sath koi form fill kar ke jana ho ga jab ke mcb lite pack k sath to koi form nhi ha form kaha se lon kindly guide me. if you have received the card then why don’t you call them and activate from there? Salam bhai mera card na helpline se active ho raha ha aur na mcb branch se helpline call karo to wo kehte hain k pehle account activate karo bank se aur minimum 300 rup deposit karo bank jao to wo kehte hain pehle card activate karo helpline se guide me pehle account active ho ga deposit ke sath ya phir helpline se card activate ho ga? I’m confused. how did you applied for the card? Oh me ne online apply kya tha card a gya but activation problem ha mere khayal me pehle branch se account active karna ho ga jese ap ne kya phir card helpline se active ho ga.
kya ap ne jo 500 rup add kye us me se 300 card ke charged hove ya nahi? Salam kamil bhai finally my card is activated so now can i use it on aliexpress for online shopping and what to write in blank first name and last name on cardholder information? And if i use it on internationally internet session activate through helpline? Is there any security issue for permanent activation like card stolen information e.t.c? Salam my card is finally activated now can i use it on aliexpress for online shopping and what to wrote in blank area of cardholder name like fisrt name last name? Is there any security issue for permenant internet session activation like stolen caed information e.t.c if i use it internationally internet session activated through helpline? 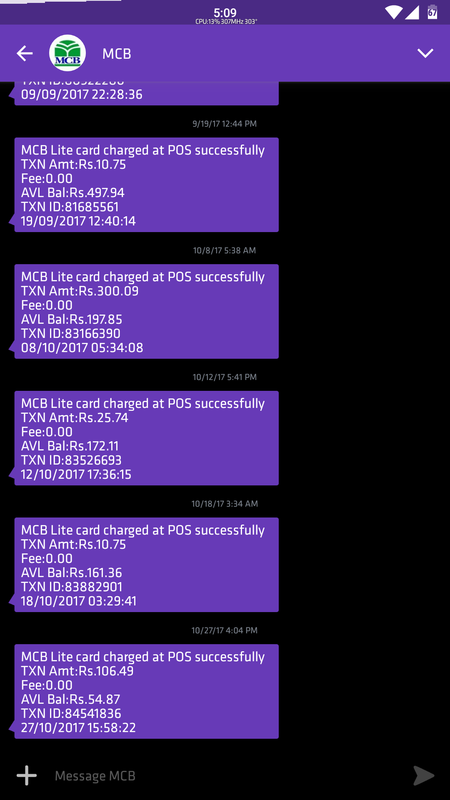 I recently got a new MCB Lite card, card is not working :D on ATM or online, Now I am stuck with helpline complaints since a week. 4% is way too much (considering the fact that we’ll be charged 3% FCE too). FCE, woh kia hota hai? Who told you that FCE will not apply? Card main PKR se dollar main free main conversion krega bank? Itni restrictions say acha hai banda HBL, Meezan ya SCB main account khol ly. Jab shopping karni ho to us main paisy daal ly warna zaroorat ka balance rakhy. HBL is the worst choice. Payment aksar fail hojati ha. Meezan ka mujhe nai pata, But SCB, SCB is best i must say. Jiska kisi bank like Meezan ya HBL me account hai wo apna debit card use kray, ya WIZ card leley, wo 116 me milay ga, bs branch me zalil hona paray ga kucj ghantay. Yeh virtual expensive hai, easypaisa wala behter tha. Hope they come back with something even better. HBL, I dont think you should recommend it. What’s wrong with that? I’m using HBL since 2014 and never had any issues. Netbanking/Mobile app works fine. The only thing I don’t like is the SMS charges they’re deducting. We are not talking about netbanking or mobile app. We are talking about online payments through your debit/credit card. Have you ever used your card on ecommerce sites like aliexpress or upwork? Yes, I used it on many sites, as a freelance developer, I had to use it everywhere. I tried my HBL Visa card on Upwork, Aliexpress and Google Cloud Platform. It didn’t work. Google Cloud Platform wasnt even recognizing it. My friends who own HBL Visa debit card had same problem. As MCB lite user, I agree. This is rip off plus hassle open bank account waiting for easypaisa to re launch card service. First he is telling that we have too many cards to carry and then tell to just add one more. Why should I carry another card and pay extra? It’s a virtual card. You don’t have to carry it. I’ll wait for Easy paisa VC to come back! I used to use that and never had any issues! UBL wiz Internet card best for online Transactions like Facebook and Google. No annual charges and no extra charges. I am using from last 2 years and still no issue face online. Fine for failed transaction? Good job UBL. Your card transactions often fail while using online. You will make a lot of money by fining your customers due to your sh*t quality service. Leave ubl crap wiz shizz. Just get MCB lite card. No transaction charges and internet session can be permanently activated. Plus you can top it up with your mcb bank account via Mcb mobile banking app. Easypaisa was offering 2% on international transportation and they closed now ubl started with 4% let’s see if they are a success. HBL debit card used to work on aliexpress before but now its not working. VISA card.. anyone having this issue. They’re charging damn too much! for ubl wiz card account is mandatory or we can get wiz card just by visiting the branch and submit the fee? how can we transfer back the amount from ubl virtual wiz card back to account ?? I’m using ubl mega wallet debit card for a long time on aliexpress and playstore. I like entropay It’s best. I was using entropay for a long time and ubl bank give me a call to stop using entropay cards. I dont know the reason entropay is the best alternative to all stupid debit cards in Pakistan. i tried different card for purchasing UBL Wiz internet card is best you can easily buy anything onlline , Othercard like mcd lite card hava too much payment problem. Can i make 2 Virtual cards in same account?